Nice job on Major Rogers! I picked up some Armies in Plastic WW1 figures a couple years back. I thought "well these should be easy to paint!" I don't think I even finished one. They took so damn long to paint. It wasn't that there was all that much detail, there was just too much surface area to cover!! Too much work for something I wasn't even going to ever play with! That was the one site I could find with pictures, and most of them weren't zoomed-in. I hope to do a couple of regiments and Indians, and Rangers, and Colonials. What system are you planning on using for your FIW/King Phillip stuff? Well, I recently convinced myself that I should stop buying wargame rules, because I'm really more of a collector/painter. I do like Song of Blades and Heroes alot. 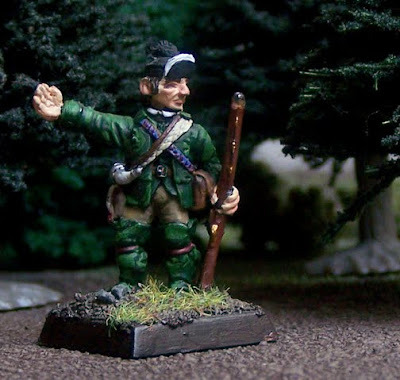 I might get the Napoleon supplement and simply swap the British rifles for FIW Indians, Light Infantry for Rangers, Regulars for Regulars. I like that This Very Ground is specific to FIW, but I'd rather spend that $16 buying another pack of models.